The temperature field of the differential casing. 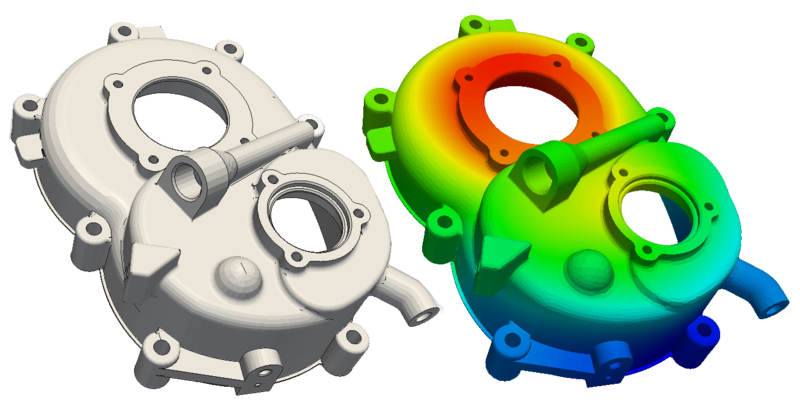 In this tutorial the thermal behavior of a front differential casing is simulated. The objective of this simulation is to analyze how hot the casing will get in operation mode as well as if there are any hot spots visible that could be avoided with a more suitable casing design. To start this tutorial import the tutorial project into your ‘Dashboard’ via the link above. After clicking ‘Ok’, a new tree will be automatically generated in the left panel with all the parameters and settings that are necessary to completely specify such an analysis. Note that the results generated with First order elements might not be as accurate as with Second order elements. But choosing a Second order mesh will lead to longer computing times so is avoided here. As for the fineness of the mesh, Coarse is sufficient. As a rule of thumb, one should make sure, that the resulting mesh does have more than one volume layer across the cross section of the model. Next you will see a cutting plane which you can adjust under Mesh Clip parameters. For example, in this case give Normal (y) a value of -1 in order to clip the mesh from the middle of the geometry. The black arrow shows the direction of clipping. Figure below elaborate the steps. This pops-up a ‘Material Library’ from which we select “Aluminium” and click on ‘Ok’. This will then load the standard properties for Aluminium. Some post processing images from the SimScale platform post processor are shown below. Select the results and click “temperature” to visualize Temperature Profile.